The Rukka brand has a deservedly fearsome reputation. 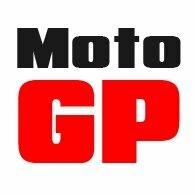 Their motorcycle clothing is, without any doubt, expensive, but Rukka’s prices are not what they are because they have to pay for huge amounts of advertising, or because they sponsor a stable of high-profile riders. In fact, in this respect, they’re probably the most tight-fisted manufacturer in the entire motorcycle business! Rukka’s prices are what they are because the company uses only the best and most expensive fabrics and materials, and employs only the latest, most high-tech technologies. This having been said, we simply don’t like and don’t rate, a lot of of the company’s products. We think the Nivala is a truly brilliant suit. Their Forsair vented jacket is the best on the market. And some of the gloves are pretty amazing too. But when it comes to commuting suits, the Nivala is so much better than anything else in the Rukka firmament that we simply cannot get excited by any of the other models. The Navigatorr suit sits one rung below the Nivala suit. But because it has no stretch in it, it is so much less comfortable to wear. 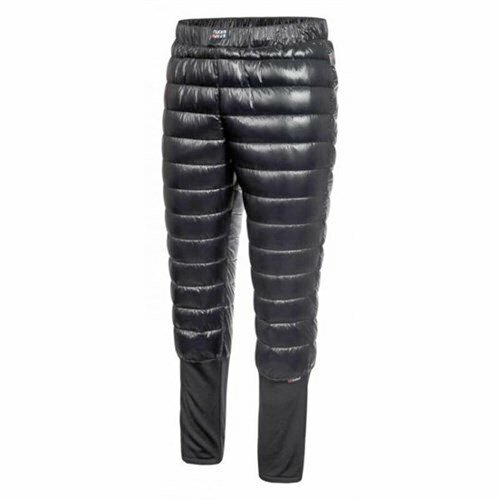 And because it has a traditional zip-in thermal liner, it is nowhere near as flexible or as warm as the Nivala. The Navigatorr jacket costs just £100 less than the Nivala, and that’s not nothing, but at this level that’s a saving of less than 10%, and honestly the Nivala is way more than 10% better than the Navigatorr. The same applies to the pants. 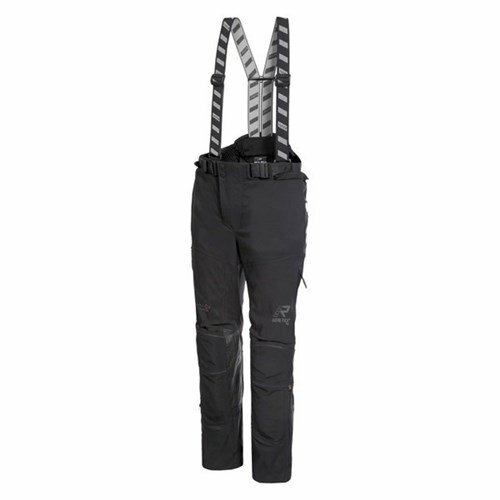 The Navigatorr pants are less expensive, but the Nivala pants are so much nicer to ride in. We don’t think the Nivala is perfect. In many respects, the Stadler All4Pro is a better, all-year-round suit, especially if you do a lot of summer touring. 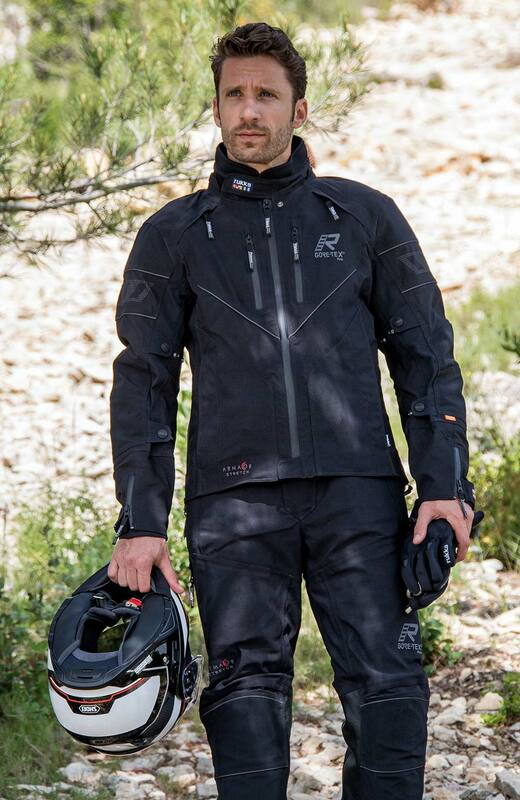 It’s better vented, comes with Superfabric in the shoulders, elbows and knees for the highest levels of abrasion assistance, has armour that is way more protective, and comes with a 10 year, rather than a 6 year, warranty. It’s also a little bit cheaper. But the Stadler is not as comfortable to wear as the Nivala, and as we head to the back end of the year, it has to be acknowledged that, with its duck-down inner jacket and pants, the Nivala is a much warmer outfit. So let’s just recap on the Nivala, what it’s got, what it does, and why we think that, at this time of year, it’s so hard to beat. Of course, the Nivala is a laminated outfit. Now most people these days know what this means, but for those who don’t, let us provide a very brief explanation. In most waterproof garments, a waterproof membrane hangs independently inside the jacket. This membrane will stop you getting wet, but water will still get through the outer fabric of the jacket. It can make the jacket heavy and wet, and when you’re riding at speed, this soaking wet material can make you feel very cold. The other issue with jackets (and pants) manufactured in this way is that they can take a long time to dry: 12 hours, 24 hours; sometimes even longer. 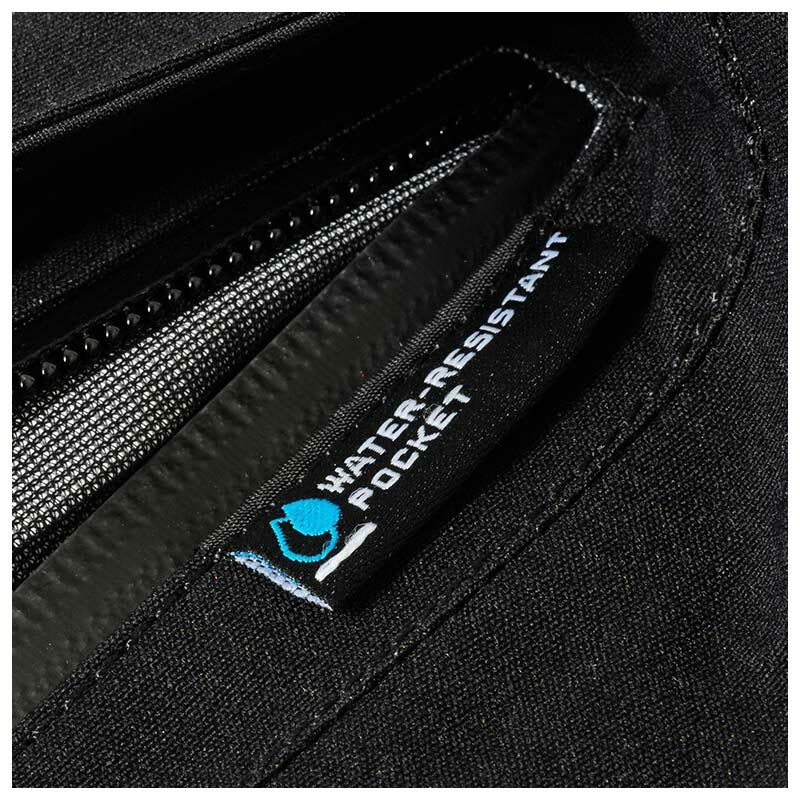 With a laminated garment, the waterproof membrane is bonded or heat-sealed to the inner side of the outer fabric. This means that the rain cannot penetrate inside the jacket. The jacket becomes damp in the rain, but it never gets soaking wet. It never ‘wets out’ as we call it. As a result, the wearer stays dryer for longer, and importantly the jacket dries out much faster after it has been used in the rain. Now lots of companies offer laminated products, but it is generally accepted that nobody does laminated technology better than Gore, who set the standard with what is known as their 3-layer Pro-Shell. You can have two-layer laminates, and you can have three-layer laminates. Three layer is more expensive, but it tends to do a better job. It is more robust, and will last longer because the third layer protects the membrane, but ironically (and it’s too confusing to go into here), it is in some circumstances more breathable too. Gore has been instrumental in developing this technology. 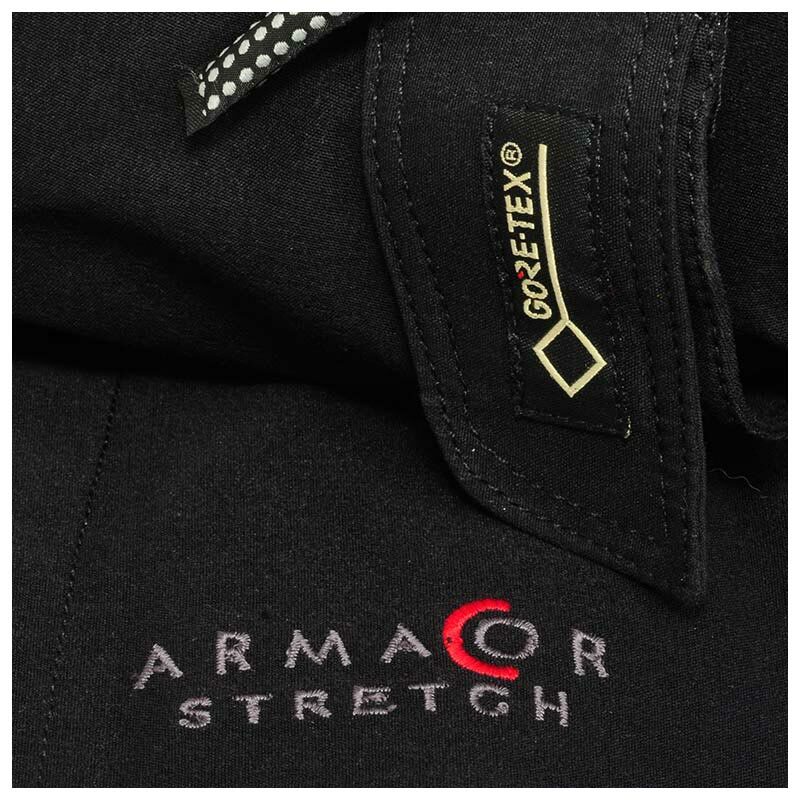 They understand it better than anybody else, and produce the most sophisticated membranes, but one of the reasons that Gore-Tex garments work better than those that use other membranes, is that any garment produced using Gore-Tex has to be approved and inspected by Gore. 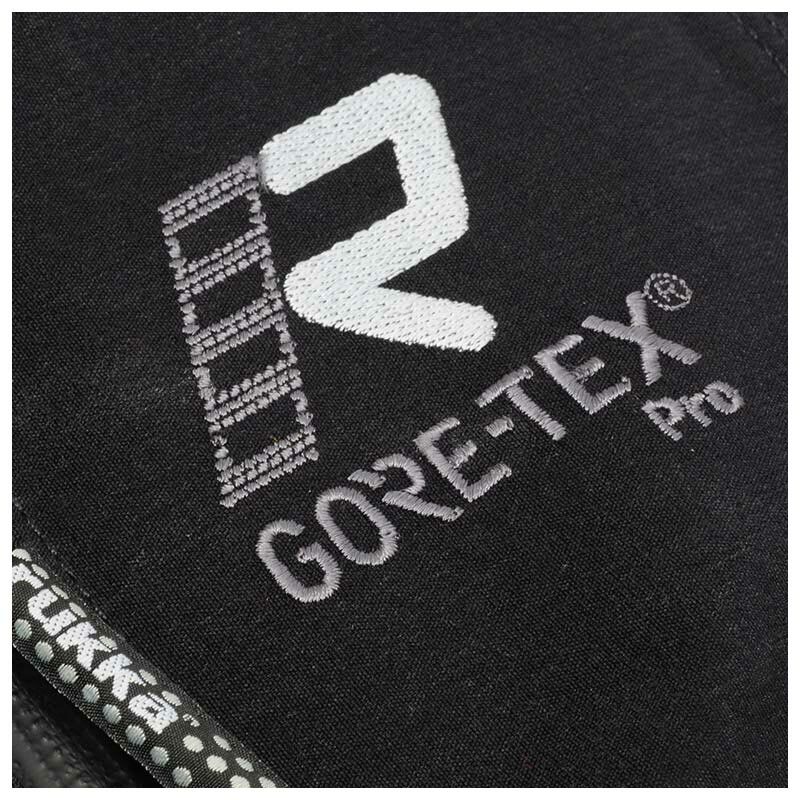 You can’t just buy Gore-Tex by the metre, and slap it into a garment. Gore will only let you use their membranes if the know that you will ensure that they can do their job properly. The bottom line is that Gore-Tex’s 3 layer, Pro-shell laminated products deliver the highest level of waterproofing, and the highest levels of breathability, that it’s possible to get. In the case of the Nivala, the Gore-Tex membrane is bonded to a highly abrasion and tear-resistant polyamide shell fabric. In the key areas of vulnerability, this material is re-enforced with panels of Armacor, an even stronger material made from Kevlar fibres and Cordura. Now, in these respects, the Nivala is much like any other Rukka outfit, but what makes the Nivala so much nicer to wear, and easier to live with, is that the outer material contains a component of a stretch material like elastane. This tiny additional component makes a world of different to the feel of the Nivala. Often, normally even, a Pro-Shell garment will be stiff, crunchy and, at times, downright uncomfortable. 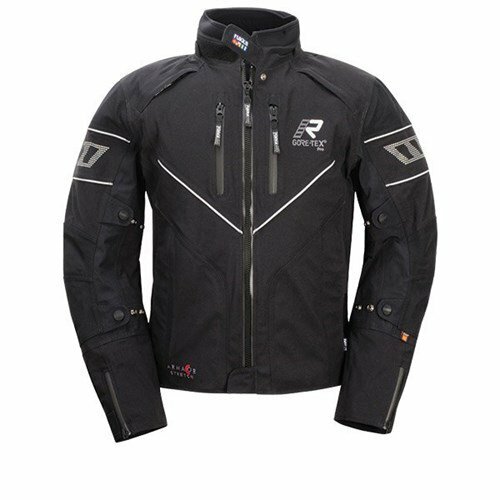 But with the Nivala that stiffness simply disappears, making it one of the most comfortable motorcycle jackets you’ll ever wear. 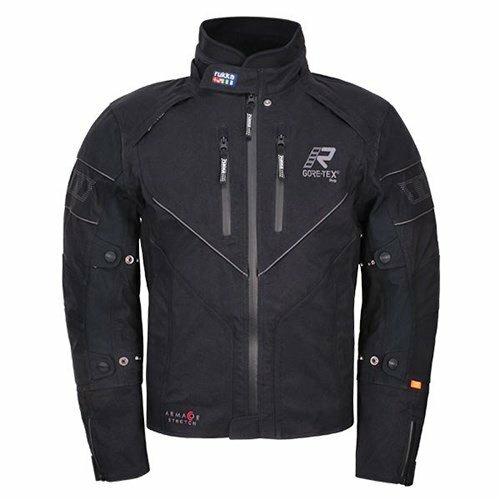 In fact, some find it more comfortable than a drop-liner jacket, which certainly couldn’t be said of any other Rukka laminated jacket. A result of this stretch is that the Nivala fits differently. Most Rukka jackets are unwieldy and quite boxy, so most people will wear them a little large to allow them a certain degree of movement. But with the Nivala, it’s the opposite. The fit is so comfortable, that one wears it tight, almost like a leather jacket. 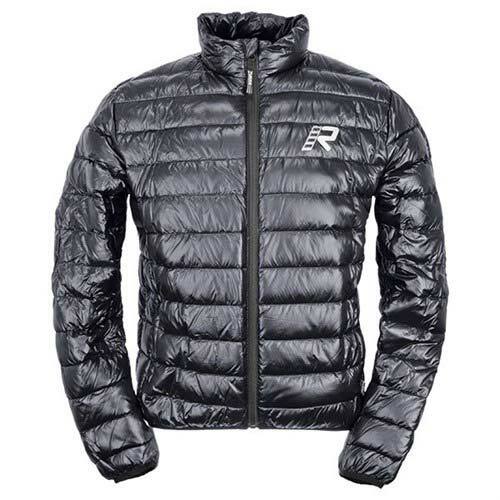 And certainly we have found that most people come down at least one size from any other Rukka jacket. The D30 armour that is fitted throughout the Nivala is, of course, another factor that makes the suit so comfortable. And Rukka’s D30 isn’t like anybody else’s. 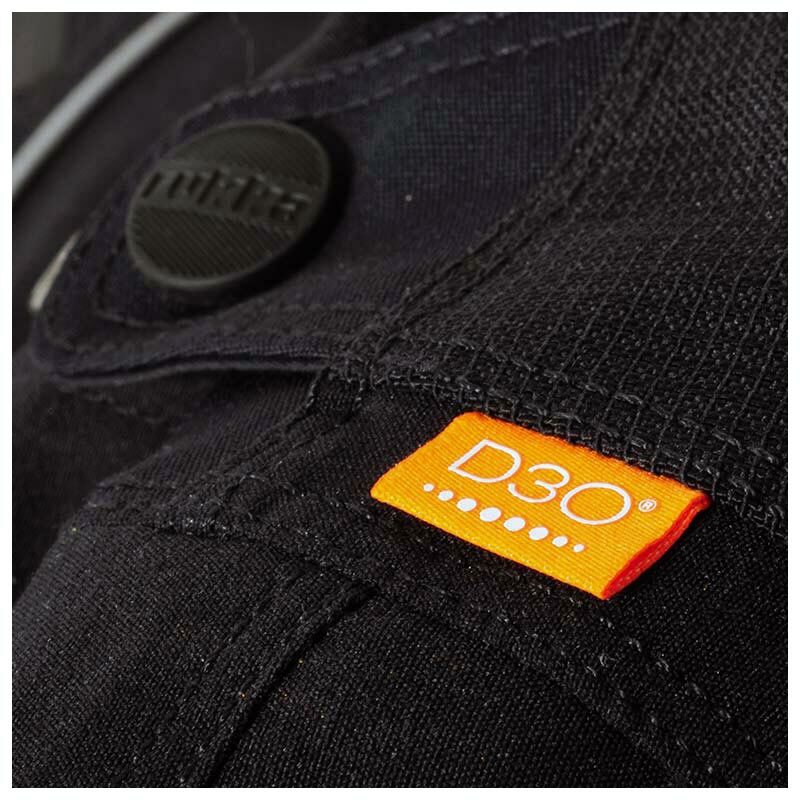 It’s much larger and more breathable than the standard D30. Pretty much however you fall, your shoulder, elbows, hips and knees are going to be covered. In only one respect does the Nivala disappoint us on the armour front. And that’s the fact that the back protector is only Level 1. At this price, we think the Nivala should come as standard with their Level 2 All Back protector. It’s available, obviously, as an upgrade, but really a suit like this should come with the best armour. But on the positive side, the Nivala does come as standard with a chest protector, which is something we see very, very rarely in a textile suit. As it’s Rukka’s top-of-the-range suit, the Nivala comes pretty much with all the bells and whistles the company has to offer. And this is another reason that it’s worth paying the extra for the Nivala, because many of the cheaper models in the Rukka range don’t. In fact, as you descend through the Rukka range, all that really happens is that features are deleted. 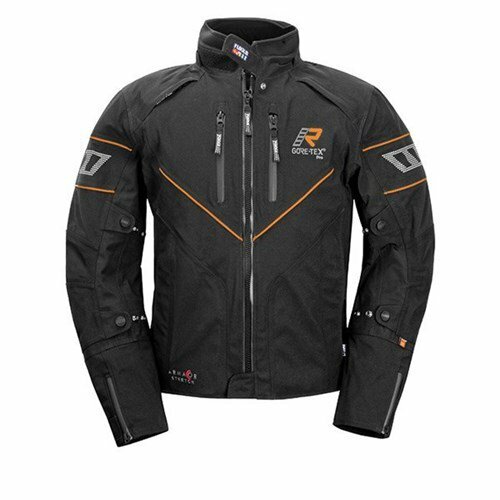 The ventilation on the Rukka is better than any other Rukka jacket. In our opinion, ventilation never is a Rukka strongpoint, and on the Armaxion, Armaxis, Armascope and Navigatorr jackets, the venting really is rather poor. In truth, the Nivala nowhere near matches up to the Stadler in this regard, but the bottom line is that the venting on the Nivala is the best you’ll ever get on a Rukka. 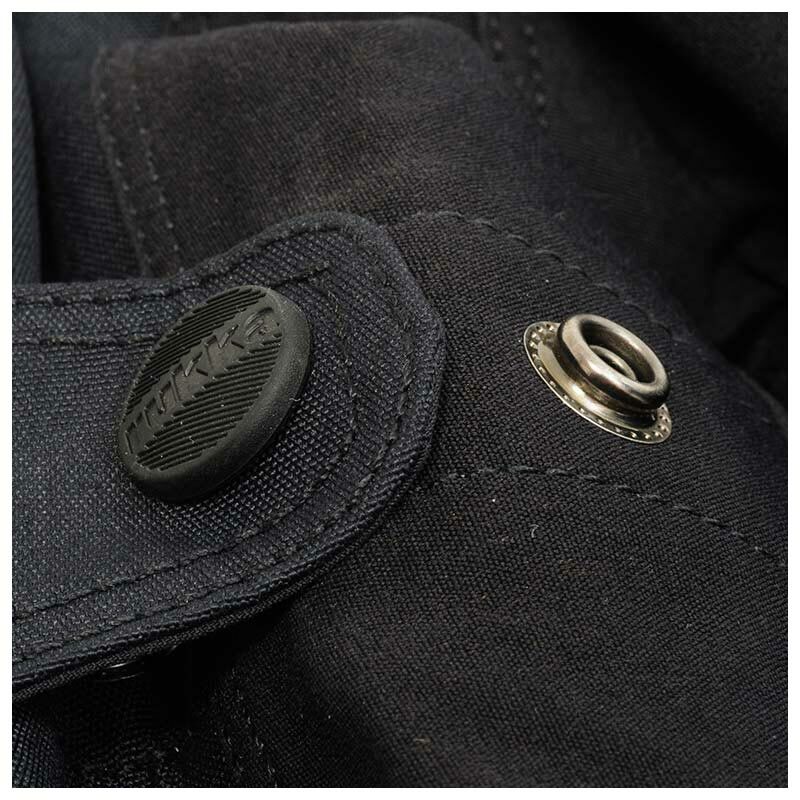 The third of the three advantages that the Nivala has over its other Finnish stablemates is its vastly superior thermal inner jacket. 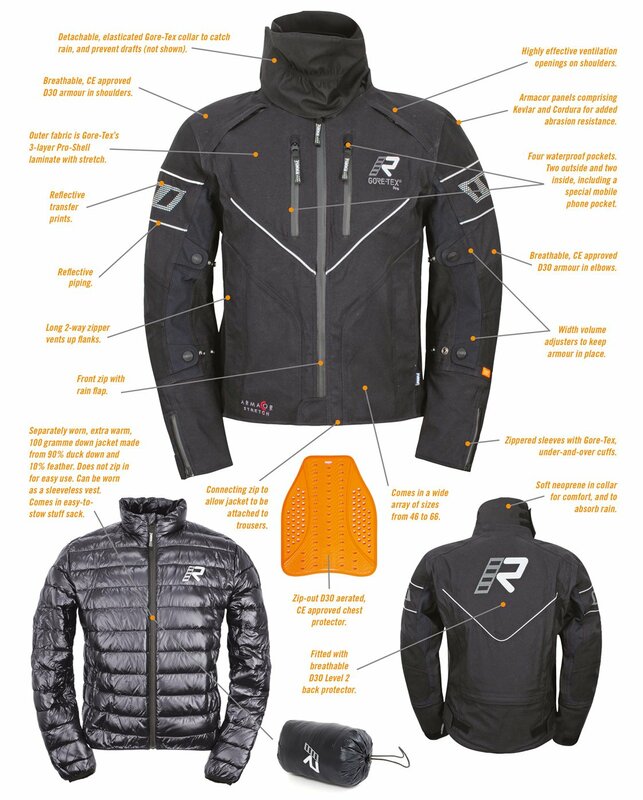 Now when Rukka first presented to us the concept of a separately worn, non-attachable thermal liner, we thought they had lost the plot. We assumed that the bean counters had won the day, and that the new jacket would save the company a couple of dollars on zips and buttons. But we were wrong. What we now know is that proper duck down garments are actually hugely expensive. And what we’ve all come to realise is that the separate jacket and pants are so much easier to live with. No zips, or buttons, no fuss. Most of the year, you won’t wear the inner layers. But if it’s cold, you slip them on, and put your jacket and pants over them. It couldn’t be simpler, and they’re so warm. Warmer than any other inner jacket we’ve ever come across. Not sure we’ve ever heard of anybody being cold when they’re wearing it. It’s also amazing because, when the main jacket goes on, the inner jacket compresses to just about nothing, meaning that it’s very rare indeed to have to take a larger size to accommodate it. We’ve only seen people going up on size on a couple of occasions, but honestly it’s extremely rare. Anyway, the jacket has four external pockets and two internal ones. The collar is lined with neoprene for comfort, but also because neoprene will soak up any rain as it comes into the jacket from the helmet. There’s also a detachable, waterproof collar that acts as a wind stopper too. The sleeves come with Gore’s famous GTX cuffs that go inside and outside of the wrist of a glove to keep both the rain and the wind out. They’re brilliant. Don’t know why everybody doesn’t do them. Does mean, though, that the sleeve of the jacket is worn short. For adjustment, you get snap fasteners on the sleeves and a Velcro adjuster at the waist. It’s pretty much the same kind of thing with the pants. There’s a two-way adjuster at the waist, and of course there’s a zipper arrangement at the bottom of the legs to allow them to be worn easily over tall boots. Obviously, the pants will zip into the jacket. The jacket can also be worn with braces, which come as standard. In our view, the braces are the only way to go. It means you can wear a pant that’s a bit looser at the waist. Braces also ensure that the trousers always sit at exactly the right height; important for ensuring the leg length is correct. In the seat, you get Rukka’s Aircushion system for comfort. 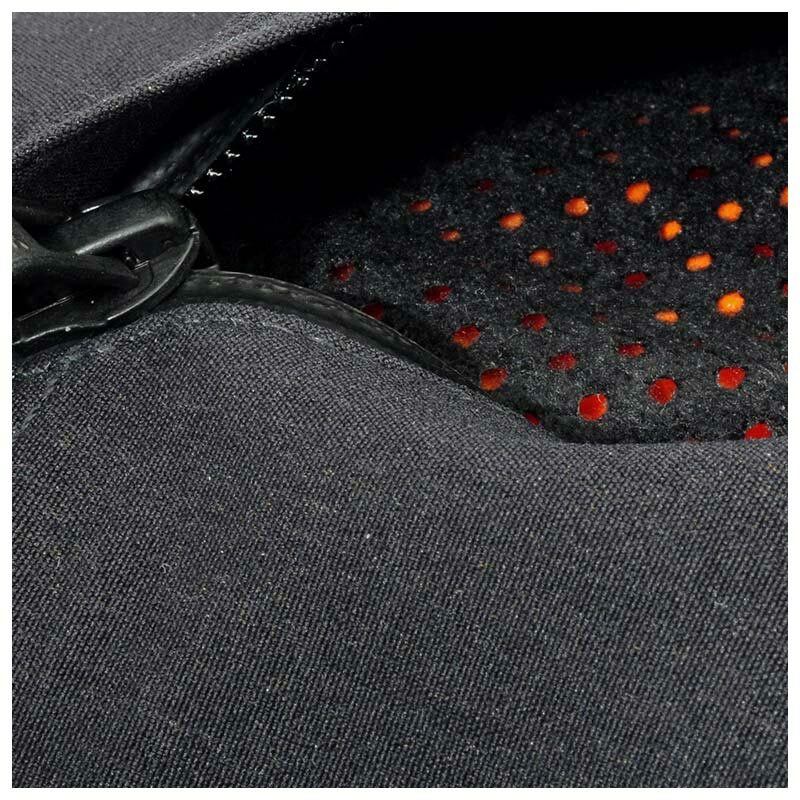 It’s the Aircushion that also prevents the rain from soaking into the trouser in the seat area in heavy rain, because membranes sometimes don’t work if the skin cannot breathe. A panel of Keprotec in the seat will stop you from sliding around on the saddle. Leather patches inside the knees provide protection from the heat of the exhaust, and give extra abrasion resistance. Sizing wise, the Nivala comes in a wide array of sizes that means it will fit most people. The jacket goes from a 36” chest (size 46) to a 56” chest (size 66). The trousers go from a size 48 (continental), which is a 30” waist, up to a 62, which is equivalent to a waist size of 44”. Importantly, the pants come in three leg lengths: regular, short and long. The regular length is available in all waist sizes. The short leg goes from 48 (30”) to 62 (44”), as does the long leg. Lastly, the Nivala jacket comes in three versions. Black with silver striping, black with orange striping, and black with black striping. The black/silver is exclusive to Motolegends. 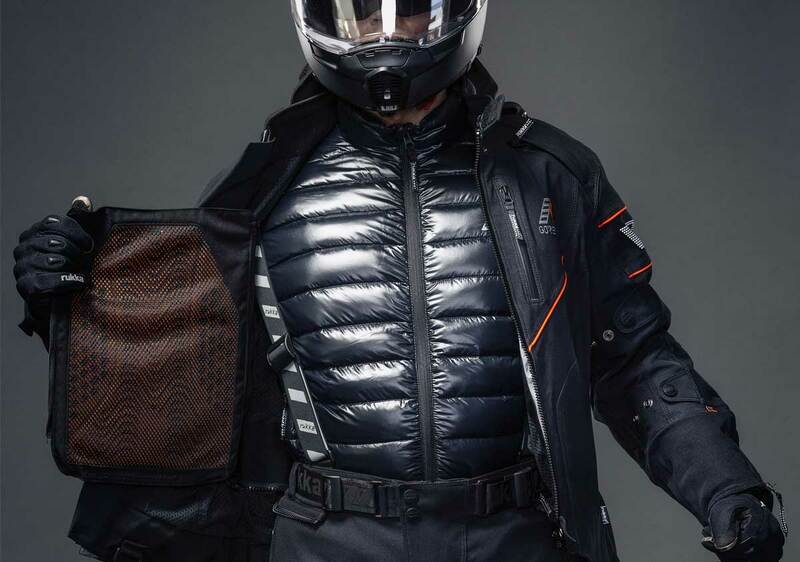 As we suggested at the beginning, the Nivala is one the world’s best winter motorcycling suits. The only suit that compares, in real terms, is Stadler’s 4AllPro. As an all-round suit, the Stadler may even be better. It’s better vented so is much nicer to ride in in the summer, it has better protection and armour, and a longer warranty. But if your priorities are comfort and warmth, then it’s the Nivala all day long. We'd like to think we're kind of the experts when it comes to the Nivala suit. We know how it should fit; we know how to make it fit. And here in Guildford, we try to carry all the sizes, and all the leg lengths, all of the time. Visit us. We'll sit you on our bike. We'll make sure you get the right size, the size that works for you. And most importantly, we'll make sure you get the right leg length. And we'll make sure that the suit is as affordable as it can be. We'll beat any discounted price by an official UK seller by a full 10%. If you take our interest-free credit, you would pay a deposit of £205, followed by 24 payments of £76.87. That's just £2.53 a day; and that's the same as the cost of a flat white from Starbucks (£2.50). 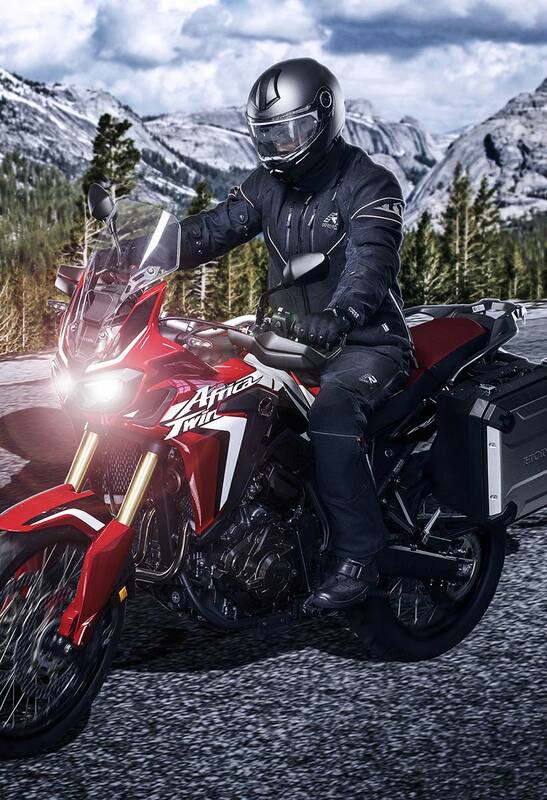 One of the best motorcycle suits money can buy, for the price of a cup of coffee. If you want to stay as warm, dry and safe on the bike as it's possible to be, it's going to cost you a daily cup of coffee. It doesn't seem a lot to pay!